Baptism a Condition of Residence. Kingdom of northern Europe. 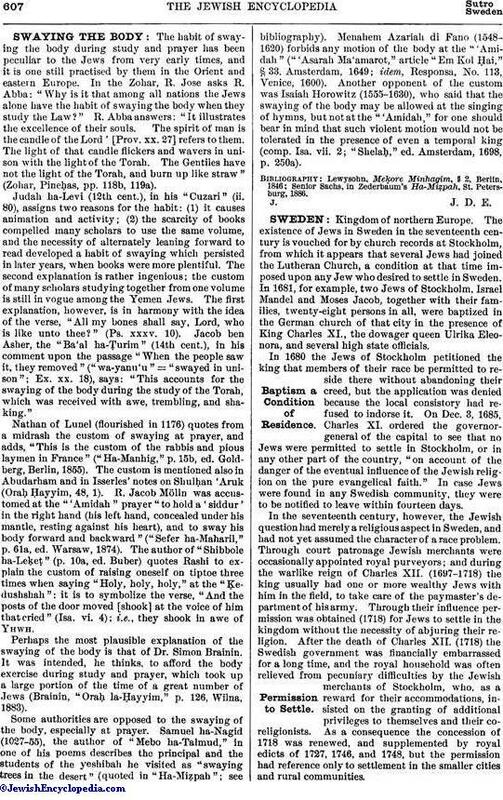 The existence of Jews in Sweden in the seventeenth century is vouched for by church records at Stockholm, from which it appears that several Jews had joined the Lutheran Church, a condition at that time imposed upon any Jew who desired to settle in Sweden. In 1681, for example, two Jews of Stockholm, Israel Mandel and Moses Jacob, together with their families, twenty-eight persons in all, were baptized in the German church of that city in the presence of King Charles XI., the dowager queen Ulrika Eleonora, and several high state officials. In 1680 the Jews of Stockholm petitioned the king that members of their race be permitted to reside there without abandoning their creed, but the application was denied because the local consistory had refused to indorse it. On Dec. 3, 1685, Charles XI. ordered the governor-general of the capital to see that no Jews were permitted to settle in Stockholm, or in any other part of the country, "on account of the danger of the eventual influence of the Jewish religion on the pure evangelical faith." In case Jews were found in any Swedish community, they were to be notified to leave within fourteen days. In the seventeenth century, however, the Jewish question had merely a religious aspect in Sweden, and had not yet assumed the character of a race problem. Through court patronage Jewish merchants were occasionally appointed royal purveyors; and during the warlike reign of Charles XII. (1697-1718) the king usually had one or more wealthy Jews with him in the field, to take care of the paymaster's department of his army. Through their influence permission was obtained (1718) for Jews to settle in the kingdom without the necessity of abjuring their religion. After the death of Charles XII. (1718) the Swedish government was financially embarrassed for a long time, and the royal household was often relieved from pecuniary difficulties by the Jewish merchants of Stockholm, who, as a reward for their accommodations, insisted on the granting of additional privileges to themselves and their coreligionists. As a consequence the concession of 1718 was renewed, and supplemented by royal edicts of 1727, 1746, and 1748, but the permission had reference only to settlement in the smaller cities and rural communities. In 1782 an ordinance was issued by which the Jews were permitted, on certain conditions, to settle anywhere in the kingdom, and to practise freely the tenets of their religion. It was, however, specified that Jews were ineligible for government positions and for election to the legislative assembly; they were, moreover, forbidden to establish schools for the propagation of their creed, and to combine with their religious services such ceremonies as might possibly cause disquietude in the minds of the general population. The government was desirous of attracting wealthy Jews to the country, but it was equally careful to keep out itinerant usurers, quite a number of whom had in previous years entered Sweden from Germany. Any foreign Jew who landed in Sweden was accordingly required to report, within eight days of his arrival, to the local authorities, and to produce his passport and a certificate of character, as well as a statement of his purpose in coming to the country. These certificates were issued by the elders of the congregation to which the immigrant belonged in his native country, and had to be verified by the municipal authorities of the place in which the immigrant had last resided. If the certificates were unsatisfactory, the authorities were at liberty to expel the holder; but in case he was admitted he was directed to Stockholm, Gothenburg, or Norrköping. Jews who were residents of the country prior to the promulgation of this ordinance were called upon to present their certificates of character to the proper authorities, together with a statement setting forth in which city they desired to settle and make their living. The ordinance enumerated the differenttrades the Jews were permitted to follow, and it stipulated also that they should apprentice their sons to Swedish tradesmen in one of the three cities mentioned above. In order to prevent the overcrowding of the mercantile field it was prescribed that no foreign-born Jew should be allowed to start in business unless he possessed at least 2,000 riksdaler (about $800) in cash or negotiable securities; a native-born Jew need have only 1,000 riksdaler. As to the retail business, the Jews were prohibited from selling victuals, liquor, and drugs, and they were permitted to retail their special articles of food, wine, kasher meat, maẓẓot, etc., among themselves only. Furthermore, the Jewish retail dealer was not permitted to offer his goods for sale in markets outside the city in which he was located, and he was compelled to conduct his business in open shops and was forbidden to peddle from house to house or in the streets. The Jews were allowed to establish synagogues in the above-mentioned three cities, and to keep rabbis and other clerical officials. Intermarriages between Jews and Christians were forbidden. For every Jewish marriage celebrated a fee of six riksdaler was to be paid to the orphanage of the royal guards, this stipulation being intended as a compensation to the army for the exemption of the Jews from military service. In order to protect the interests of descendants of immigrant Jews the state ordered that, on the death of a Jew, the elders of the congregation should make an inventory of his estate and submit an account thereof, either to the orphans' court or to the municipal authorities. The Jews, however, had the right to appoint guardians of minors; and a rabbinical court had jurisdiction in inheritance cases. In litigations between Jews and Christians where the facts could not be established except under oath, the Jew might be ordered to take the customary Jewish oath in the synagogue in the presence of the judge. A Jew convicted of perjury became liable to expulsion from the country. The ordinance of 1782 contained a separate clause referring to "particularly wealthy Jews, or such as are proficient in some trade almost, or quite, unknown in the country." Such persons could, through the Department of Commerce, petition the king for privileges and concessions other than those granted in the general ordinance. After 1782 the Jews gradually secured concession after concession from the government, but those living in Stockholm grew overconfident, and carried their ambitious designs so far that a feeling of indignation arose among the general population against the ambitious Jewish financiers. 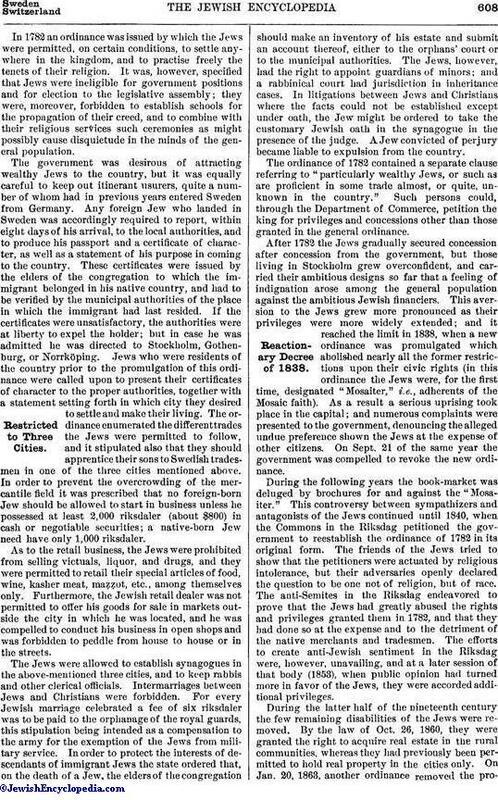 This aversion to the Jews grew more pronounced as their privileges were more widely extended; and it reached the limit in 1838, when a new ordinance was promulgated which abolished nearly all the former restrictions upon their civic rights (in this ordinance the Jews were, for the first time, designated "Mosaiter," i.e., adherents of the Mosaic faith). As a result a serious uprising took place in the capital; and numerous complaints were presented to the government, denouncing the alleged undue preference shown the Jews at the expense of other citizens. On Sept. 21 of the same year the government was compelled to revoke the new ordinance. During the following years the book-market was deluged by brochures for and against the "Mosaiter." This controversy between sympathizers and antagonists of the Jews continued until 1840, when the Commons in the Riksdag petitioned the government to reestablish the ordinance of 1782 in its original form. The friends of the Jews tried to show that the petitioners were actuated by religious intolerance, but their adversaries openly declared the question to be one not of religion, but of race. The anti-Semites in the Riksdag endeavored to prove that the Jews had greatly abused the rights and privileges granted them in 1782, and that they had done so at the expense and to the detriment of the native merchants and tradesmen. The efforts to create anti-Jewish sentiment in the Riksdag were, however, unavailing, and at a later session of that body (1853), when public opinion had turned more in favor of the Jews, they were accorded additional privileges. During the latter half of the nineteenth century the few remaining disabilities of the Jews were removed. By the law of Oct. 26, 1860, they were granted the right to acquire real estate in the rural communities, whereas they had previously been permitted to hold real property in the cities only. On Jan. 20, 1863, another ordinance removed the prohibitionagainst intermarriages between Jews and Christians, which were declared to be legal provided they had been attended by due ceremonies. A later ordinance (Oct. 31, 1873) stipulated that the issue of marriages between members of the Swedish state church and Jews should be brought up in the Lutheran faith. If, however, a pact concerning the religion of their future children had been made in writing by the parents before their marriage, and submitted to the clergyman or other authority who performed the marriage ceremony, such agreement should remain valid. There are, of course, various privileges which the Jews, like any other non-Lutherans, can not obtain as long as the present constitution of the Swedish kingdom is in force. Thus, they can not become members of the council of state; nor can they, as judges or as members of committees, take part in discussions concerning religious questions. Otherwise they enjoy the same rights and are subject to the same duties as the Swedish citizens of the Lutheran faith. During the reign of Gustavus III. (1771-92) the Jews of Stockholm invited Levi Hirsch from Alt-Strelitz, Mecklenburg, to officiate as their rabbi. The first Swedish synagogue was located at Köpmantorget (Merchants' Square), Stockholm, in the Sjöberg house. After a few years this place was found to be too small, and the Jews in the capital selected the old auction chamber at Tyska Brunn (German Well), where they worshiped until some years ago, when a synagogue was erected at Vahrendorfsgatan (Vahrendorf street). 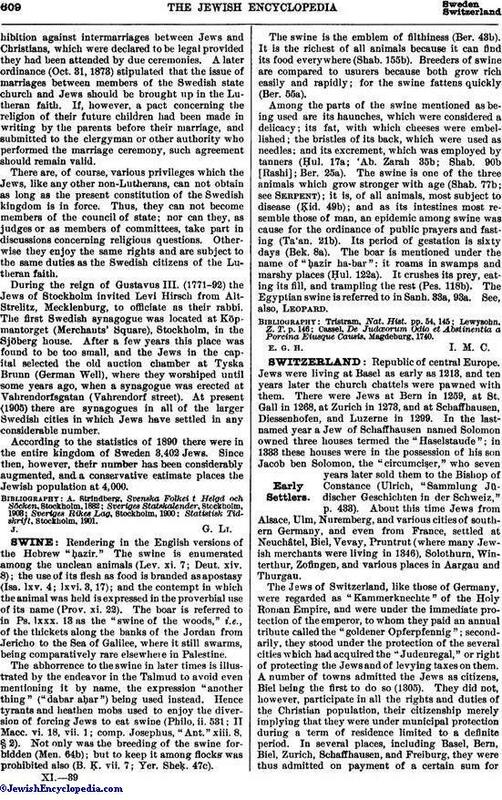 At present (1905) there are synagogues in all of the larger Swedish cities in which Jews have settled in any considerable number. According to the statistics of 1890 there were in the entire kingdom of Sweden 3,402 Jews. Since then, however, their number has been considerably augmented, and a conservative estimate places the Jewish population at 4,000.